Continuum Health Services selected the th+a team to provide programming, planning, architecture and interior design for the adaptive reuse/renovation of a medical office building to accommodate a 60,000 square foot licensed freestanding rehabilitation hospital. Due to the owner’s deadlines, programming, design and construction documents were completed in three months while construction was completed in ten months. In order to convert the existing MOB from business occupancy to an institutional occupancy hospital, the internal nonstructural components of the building were demolished. For patient rooms, the exterior façade was partially demolished to lower the windows to 36” from the finished floor. The most challenging components for construction were the program’s needs for hospital-size patient elevators and an indoor in-ground therapy pool. The bed unit provides for 30 private rehab patient rooms as well as 12 private head trauma rehab patient rooms. Open dining and gathering spaces are centralized for daytime therapy activities, and special isolated patient rooms and unique features for bariatric patients were also accommodated. 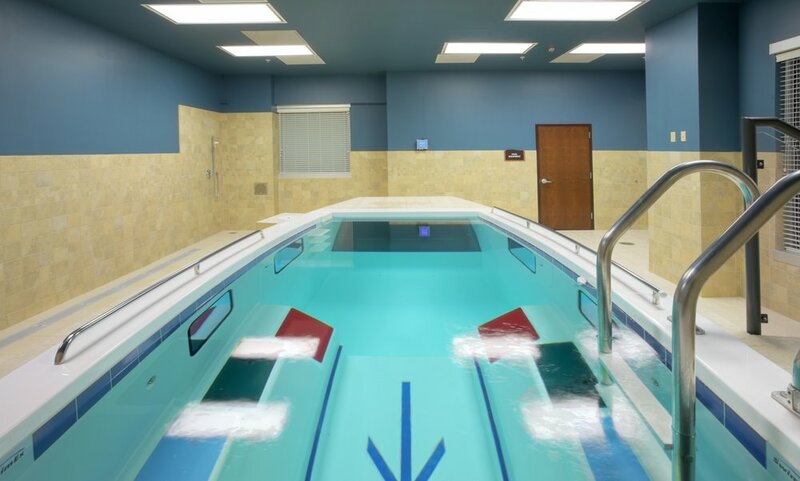 Therapy components include a separate inpatient physical therapy gym and an outpatient physical therapy gym with aquatic pool therapy. The program also includes occupational therapy rehabilitation spaces, an outdoor therapy garden, and an inpatient pharmacy with USP 797 compounding requirements and laboratory. Support components include Materials Management, Medical Records, Administration and Food Services.